The NZTA yesterday announced the what it would fund over the next three years as part of its National Land Transport Programme 2015-18 (NLTP). The NLTP combines funding from the National Land Transport Fund (NLTF) – which is essentially road/fuel taxes, council rates and from other government funding sources such as for the spend up on regional roads announced last year. The headline figure is that over the next three years $13.9 billion will be spent on transport which is about 15% more than the 2012-15 NLTP and of which about $10.5 billion comes from the NLTF. Most of the rest comes from local councils through rates. Where the money comes from and where it is being spent is quite well shown in this graphic from the NZTA. As you can see above the vast bulk of the funding is going on building new and maintaining existing roads. Of the $5.5 billion for road improvements the majority (almost $4.2 billion) is going towards State Highways. None of this is particularly surprising as it’s a continuation of the trend we’ve seen for a few years now and one that has been continued with the current Government Policy Statement (GPS) which the NLTP has to give effect to. The GPS doesn’t set specific funding levels but it does provide funding ranges for each category. Just how the actual investment in this programme compares with it’s GPS funding range for each category is shown below. You an quite see quite clearly that for State Highways the funding level is well above the midpoint set by the government – although interestingly local roads are at the bottom of their range (note: this is just for funding from the NLTF so doesn’t include rates). One area that is at the top of its range is walking and cycling where the NZTA are putting in over $100 million which is on top of the $96 million from governments Urban Cycling Fund. One aspect I was interested in was how the money is divided up across the regions. A lot was said about how Auckland is getting ~$4.2 billion in funding however when you look at on a per person basis (using Stats 2014 population estimates) it appears Auckland is spending about the National average while it’s the Waikato doing pretty well. Just looking specifically at Auckland around $4.2 billion will be spent over three years. I find the press release and other information about this investment quite odd as it seems the NZTA are doing everything they can to avoid saying how much their spending on roads. They focus attention on the $1.175 billion going towards Public Transport (of which only about $176 million is for new PT Infrastructure and services), on the $960 million on road maintenance and the $91 million on cycling yet there is very little focus on the over $2.1 billion being spent on roads, $1.8b of which is state highways. Mr Zöllner says Auckland’s future depends on a strategic joined up approach to both its motorway and local road network, along with critical public transport, walking and cycling networks, to ensure highly reliable, dedicated and congestion free travel. It is claimed that spending $960 million on maintenance will help ease congestion, I’m not quite sure how that will work. That the changes to the Northern Motorway will include the design and consenting for extending the busway to Albany which is good although no actual construction on it will happen within this time. They also say the motorway widening is only to address predictions of large travel demand in the future i.e. there is no proof it will actually happen and of course any predictions of large demand for PT seem to be ignored, especially by the government. These projects aim to address predictions of large travel delays in peak times within the next decade, and provide alternative travel options. The NZTA are now talking about the package of works to widen the southern motorway between Manukau and Papakura as part of the route between Auckland, Hamilton and Tauranga. As such seem to be lumping in the time savings from other projects such as the Waikato Expressway to claim the works will help save 30 minutes. This is odd seeing as one of the reasons they lost the Basin Reserve Flyover was that they lumped in time savings from other projects. It’s been cut from the online version but in the original emailed version of the press release they claim the Puhoi to Warkworth motorway will save up to 30 minutes, odd seeing as it only currently takes about 20 minutes now except for about four days a year in a single direction. Road of National Significance, providing a safer, more reliable connection between Auckland and Northland by extending the four-lane Northern Motorway (SH1) to Warkworth. The project is estimated to cut 30 minutes from journey times in peak periods. This map shows where the NZTA is investing. It seems to me that the symbols are way off in some places and also minimise the impact of massive projects such as Waterview which only gets a single icon for all the North Western work that’s happening. One of my big concerns about the PT funding in particular is that it simply won’t be enough investment to cope with the increase in demand. The NZTA say they think with this investment that over the next three years PT patronage will increase to 21%. Given we’ve had roughly a 10% increase in patronage over the last year alone and we still have the New Network, integrated fares and the completed roll out of the new electric trains that 21% figure seems a little undercooked. Lastly I think the NZTA deserve credit for how they’ve made the NLTP data available. Through this table you can select any combination of activity classes and regions and get a list of every single project that will be funded from the NLTF and also download all of the data easily. A per-capita basis doesn’t make much sense anyway, as it implies that people only travel in the area that they live (and doesn’t always match freight demands). Much more useful to see the veh-km-travelled (VKT) figures for each region, e.g. http://www.transport.govt.nz/ourwork/tmif/transport-volume/tv001/ which show that Waikato has 40% of Auckland’s road VKT (but only 30% of the population); similar situation for West Coast (VKT% is about twice population %). Canterbury obviously is also a special case too due to the extra $$ invested for the rebuild. Thanks for the links below about Canterbury Glenn. Is it possible to get a regional marginal user analysis? For instance analysing the increase in vehicle kilometres travelled (VKM), the same data for public transport, projected population growth compared with projected new transport expenditure -PT versus road. Looking at the increase in VKM -the only areas of significant increase is Auckland, Waikato and Canterbury in that order. From memory projected population growth is about Auckland, Canterbury and Waikato in that order. That’s true but Auckland is trying to deal with decades of underinvestment that aren’t simply attributable to allowing for where Aucklanders might happen to travel at some stage. Auckland really needs one-third minimum to stand any hope of catching up on capital spend, and NZTA need to have the power to divert that to things like rail projects. I think Christchurch is the city with the biggest deficit in transport infrastructure from decades of under investment followed by earthquakes destroying much of what there was. Worse still the urban form response to the earthquakes has been this leap frog dispersed form that has lost its middle. Despite all of this, Christchurch is NZ’s second biggest city and second fastest growing city, it is the largest agglomerated mass of humanity in NZ outside of Auckland. Strategically Christchurch is NZ’s best chance to get a second city of international standing. A few kilometres of periphery motorways will not achieve this though. I’m really looking forward to Puhoi to Warkworth cutting 30 minutes of my journey. My parents live up that way, and it currently takes me 50 minutes to get to their place – a 20 minute journey would be much better. Given it takes me about 15 minutes to get to Oteha Valley Rd, and 10 minutes from Warkworth to their place, I’m really excited by the prospect of Oteha Valley to Warkworth taking NEGATIVE FIVE MINUTES. Pretty sure the East-west links will do even better, given all the hype it’s getting. 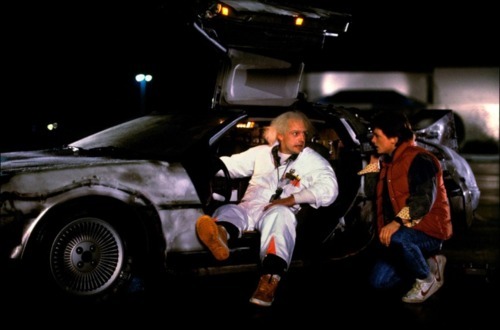 We’d need to increase the speed limit to 88mph (142km/h to activate the flux capacitor of the DeLorean – of course if we just increased the speed limit without requiring time travelling DeLoreans then that would cut 20 minutes off my journey. They’ve done the same with the proposed Petone to Grenada road in Wellington, which will somehow save 15 minutes off an 11 minute drive. When I first looked at this I thought the BLOG was wrong. Then I realised the Blog says Puhoi to Warkworth takes 20 minutes. I was thinking of Puhoi to Wellsford. It takes me 35 minutes to go from Puhoi to Wellsford. I think that my driving is a close estimate of maximum time to drive, given I drive a 1.3 litre car and have been stopped twice by police on state highways for driving too slow. So did petrol excise increase by 3c today? Interesting seeing how “Congestion Free” is being co-opted. Positive in that it signifies the influence the idea is having, not-so-positive in that the “Network” part has been dropped. The classic political manoeuvre of course, neuter the opposition by adopting their position ahead of them while also watering it down. I’m still annoyed that the NZTA is about to spend a billion dollars on a road along the Manukau foreshore, because they refuse to upgrade four sets of traffic lights. Interestingly the iwi in the area support the East – West link on the basis that it will help treat contaminants reaching the Manukau Harbour. So the project isn’t all bad. Yes NZTA, unlike AT, are really good at selling possibly questionable or incidental minor fringe ideas about their massive builds to special interest groups in advance of public announcements to split opposition. AT of course don’t have their resources but ought to learn from this all the same. The Waikato expressway is only about 2 decades early. The massive spend-up in the desperate hope the traffic turns up is extraordinary in contrast to the failure to meet evident demand for good and spatially efficient urban public transport. Government ministers even attack the identification of future Right of Ways for PT routes, and government and local agencies fail to reserve them. Worst of all is the onward march of the appallingly upside-down approach to planning for future additional capacity across the Waitemata Harbour. There a designation is being made for a design that totally precedes any thorough analysis of the need. Cart, horse, before. I drove along the new section into Hamilton 9am a few days ago and saw no more than 5 cars the whole way. No trucks. It made me wonder what the real cost benefit of this is. Patrick you contradict yourself. In the past you have spoken about how cars should be reduced in an urban environment and used in rural areas where PT is not feasible on a cost/frequency basis yet you dismiss the Waikato Expressway? The Waikato for many years was one of the most dangerous places to drive with deadly head on crashes happening on nearly a weekly basis. Thankfully this has reduced with the first stages of the expressway. There are large volumes of traffic through and within the Waikato area and two-bit country roads just don’t cut it compared to proper highways. These should have been built and finished a decade ago! No contradiction Bruce. I do not oppose road spending, nor rural and interregional highway improvements. But massive gold-plated decades in advance of demand duplicative road building versus timely upgrades or sensibly programmed new routes are important discussions to have. There are enormous opportunity costs to the acceleration of a few massive projects that is the RoNS, and the delay and suppression of alternatives. There is little evidence or even enquiry about the economic value of this programme. It is just assumed and repeated by gov, NZTA, and local boosters that this programme will add to our wealth. Despite each project have BCRs below 1, and all sorts of tricks; double counting, ‘borrowing’ of benefits from other places, and discounting of negative externalities that go into even these figures. In short it’s the haste of TG, the HH, and the WE, that we question. makes me wonder how long we can keep adding more demand to a finite resource, the cyclist might have some wonderful highways to sprint along in the not to distant future. I must be blind. I cannot find the word rail anywhere. Trains do run on land, don’t they? Not according to our LTP process, where rail is a totally separate thing. See my comment below. I dont see any funding for rail. It is part of the land transport system. Where is rail funded from? It is funded outside the Land Transport Programme. Which makes it even more of a political football than it already is. NZTA is currently unable, by the law’s setup, to fund rail. Thanks for the clarification Max. So where does rail funding come from? NZTA only funds PT if it will be of benefit to road users. This seems like a big increase in funding for Canterbury. Can anyone see where it is going. New projects? Repairs and maintenance of earthquake damaged infrastructure? Funny how all of these NZTA and AT projects and programmes really highlight the public transport spending when it is normally just a fraction of the budget. They know people want public transport hence why they constantly talk about it, but behind the scenes they still spend the vast majority of their money on roads. There seems to be a lot of ‘Transport Choice’ icons on that map despite only a $176 million spend. What is the ‘City Centre Bus Infrastructure’ on the map? Yeah, what is it? Is it the bus lanes on Albert, Nelson, Hobson streets, etc.? Where is the ‘return of seal extension funding’ on the list? So the spend on PT infrastructure is up from zero but is still being misleadingly lumped in with PT operations spend to make it seem vaguely proportional. I look forward to a specific post on that aspect if anyone has time. As for the proportion of spend by region, if we are building infrastructure that will last many decades then the relevant period to be benchmarking is not now but over the life of the asset. It is pretty clear that about 60% of this nation’s total population growth over the next few decades is in Auckland. The provinces need strong national leaders telling them that anything less than about half the total is Auckland not getting it’s fair share, which will hamper the whole country’s economy. Or they could allow regional funding tools and get out of the way. For the item for funding coming from “State highway property” it says the funding is from fuel excises (the exact same wording (although somehow different spacing) as for “Fuel excise duty (net)”) but surely this is incorrect, and the funding source is from the sale and/or leasing of land or something like that?